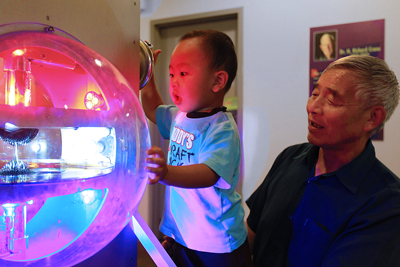 Our preschool gallery offers Engineers on a Roll, our popular exhibit that features bright colors, balls, buckets, ramps, and tracks. Kids play while learning about inertia, motion, and physics. It’s also home to our popular preschool water table exhibit. Ideal for ages 1 to 4, this room also allows for older sibling helpers. Join us for Little Scientist Club on Tuesday and Saturday mornings. More information about this and our other programming for toddlers is on our event calendar. Engineers on a Roll is our most popular exhibit in the preschool gallery. Check out the video below!